YORKTON: The Parkland Regional Library is reducing services and laying off eight people to deal with the 58 per cent budget reduction from the provincial budget. 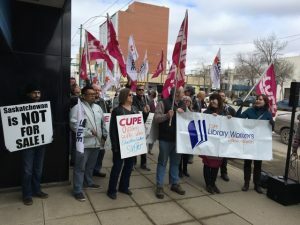 Seven CUPE members are among the workers facing a layoff. While the library is not looking at closing branching or reducing hours, the funding shortfall means fewer new books and less e-resources, an end to holds from other libraries, and an end to the ability to pick up books at one branch and drop them off at a different branch. These changes come on top of the news that the world recognized provincial inter-library loan system is being shut down. CUPE represents over 700 library workers across the province.